Z symbolem ONI na zbroi? Może Palmer? Frankie się odezwał na Halo Waypoint. Jak to się czyta, to mam wrażenie, że w tym roku jakiś prolog chcą dać. As you’re probably aware, my boss and studio head for 343, Bonnie Ross, officially announced the next installment in the Halo saga: Halo 5: Guardians, coming in fall 2015 for Xbox One. I will be up front and admit that I don’t have much more detail to add, but here at Waypoint, our conversations tend to be a little more insider, a little more familiar. And this is no exception. Last year at E3, Bonnie famously said, “Your journey begins in 2014…” Wait – hang on – you thought: “What journey is she talking about and why is Chief wearing a poncho?” Okay, some might call it a cloak, but the fact remains – you knew something more nuanced was afoot. 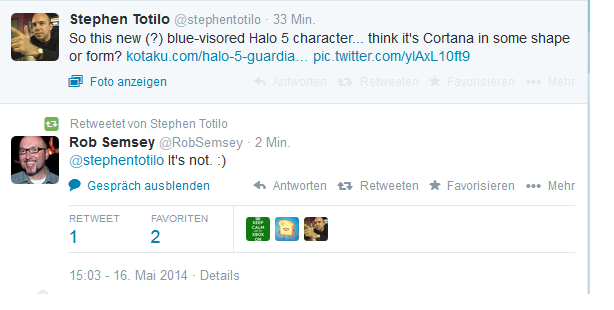 So it’s quite likely that Bonnie’s 2015 release announcement today surprised no one in the Halo community. In fact, I suspect most of you who read the Halo Bulletin regularly anticipate there’s even more to come. Well you might be right, but we’ll have significantly more to say about that at E3 and beyond. Suffice it to say, another shoe has yet to drop. But getting the Halo 5: Guardians announce out of the way is a big weight off our shoulders. This audience has correctly stated and assumed that you can’t necessarily squish a full Halo game into anything less than a three year development schedule – and at least up to and including Halo 5: Guardians, that’s more or less true. But we’re not just making a new game in that three year span, we’re also making a new engine. During the development of Halo 4, we pushed the Xbox 360 and the engine to its limits, and we were happy with the way we were able to make the Halo universe look. The Xbox 360 still has a few tricks up its sleeve, even now. We are moving to a whole new platform with the Xbox One – a new architecture, new graphics hardware and bluntly some new ways to think about gaming, period. Bonnie also called out 60fps and dedicated servers last year – attractive, desirable, and possibly expected upgrades to the Halo experience. After all, we won’t be the first 60fps shooter out there. That said, these must-haves are not necessarily easy to achieve. Previous Halo titles, Halo: Combat Evolved and Halo 2 for example, strove to push the entire ecosystem forward – dual stick FPS with big open spaces in the case of Combat Evolved, and broadband matchmaking in Halo 2 – are just a couple of examples of the series innovating or amplifying ideas. So in building Halo 5: Guardians, we want to push the ecosystem as well as the universe. And we’ll have some surprises in store for new and loyal players of the series. So that’s it for now, but E3 is just around the corner. So if you bide your time and hold your breath, you won’t have to wait too long to hear about the next steps on this Great Journey. a Spartan Ops. S02 pewno nie wchodzi w gre ? Frankie na GAFie: It's not Palmer and it is not a girl. Cos w ogole wiadomo o starcie Waypoint na X1? Brakuje mi tej appki, sporo czasu w niej spedzilem. Moze na E3 cos bedzie wiecej. No kuzwa mowilem ze Spartan NexGen pewno jakis nowy co niby mial zastapic generacje Master CH. Czyli co, Master Chief szuka Cortany, a wszyscy na niego polują, z ONI włącznie? Ty mówisz o Mjolnir Armor Mk.V, ja mówie o kolejnej generacji Spartan, gdzie juz 4ta ich wersja byla zalosna (takie tam gloryfikowane ODST).